The collect and readings for today, Proper 13B, may be found here. The following sermon is based on John 6:24-35. We live as hungry people in a hungry world. Everyone is looking for something that will sustain and nourish life, something that will feed and energize, something that will fill and satisfy. Everyone is looking for bread. The problem is not that we are hungry, but the kind of bread we eat. Think about the varieties of bread being eaten in our lives and in the world today. King David is surely not the only one to have ever eaten the bread of betrayal, adultery, or murder. In Syria both sides are eating the bread of violence and war. Republicans and Democrats share the bread of negativity, hostility, and name-calling. In the Chik-fil-A debacle both sides are eating the bread that objectifies and depersonalizes another human being. Many of us eat the bread of having to be right and get our way. We eat the bread of hurt feelings and resentment. Sometimes we eat the bread of loneliness, fear, and isolation. There are times we eat the bread of sorrow or guilt. Other times we eat the bread of power and control. Sometimes we eat the bread of revenge or oneupmanship. We eat all kinds of bread. The bread we eat reveals something about the nature of our appetites. The world is full of bread and yet far too many live hungry, empty, and searching. That says something about our appetites and the bread we have eaten. It’s a sure sign that the bread we have eaten cannot give real life. It is perishable bread that nourishes only a perishable life. It leaves us wanting only more of the same. Not all bread sustains and grows life. Not all bread is nutritious. If you want to know the nutritional value of the bread you have to look beyond the bread. Where did it come from? What are its ingredients? They do not marvel at yesterday’s miracle, give thanks for God’s generosity, or even wonder who this rabbi is. It sounds to me like they are worried they might have missed the next meal, that Jesus started without them and they are too late. They saw no sign, no miracle, in yesterday’s feeding. They saw nothing more than fish and bread. They either refused or were unable to see beyond the fish and bread. They are interested only in their own appetites and Jesus knows it. The food that endures is Jesus himself. He is the bread that is broken and distributed for the life of the world. He is the bread that is broken and yet never divided. He is the bread that is eaten and yet never exhausted. 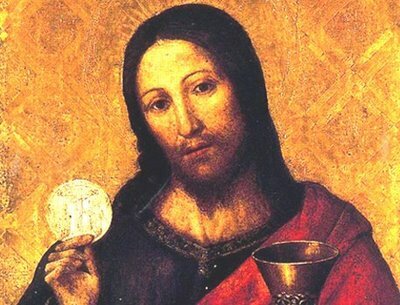 He is the bread that consecrates those who believe in and eat him. When we believe in Jesus, eating, ingesting, and taking him into our lives, we live differently. We see ourselves and one another as persons created in the image and likeness of God rather than as obstacles or issues to be overcome. We trust the silence of prayer rather than the words of argument. We choose love and forgiveness rather than anger and retribution. We relate with intimacy and vulnerability rather than superficiality and defensiveness. We listen for God’s voice rather than our own. Ultimately, we seek life rather than death. “I am the bread of life,” Jesus tells the people. “Whoever comes to me will never be hungry, and whoever believes in me will never be thirsty.” He is offering the people himself. He is the imperishable bread that nourishes and sustains imperishable life. Jesus makes us the same offer. He offers himself to us in every one of our relationships: family, friends, strangers, enemies, those who agree with us, and those who disagree. In every situation and each day of our life we choose the bread we will eat, perishable or imperishable. In so doing we also choose the life we want. So I wonder, what bread will we eat today? Michael, this sermon calls me to that unity and absence of division (nonduality) of which I need to be reminded. Thank you, dear friend, for your wisdom and ability to see beyond the mere divisive words we read/hear to wisdom and Unity with the Holy One. Thank you. Jan, thank you for kind words. You give me too much credit. I have only named my own struggle. Unity is hard work, but holy work. Fantastic post, will reblog shortly. Really hits the nail on the head. Jill, thank you so much for your encouragement and reblogging my post. As always, mi Padre, wonderful and thoughtful! That I may have eyes to see, and you have opened them to seeing where my bread lies…thank you. May you always feast on the Bread of Life.